Richard Bright discovered the relationship of renal failure and anaemia in 1836. Anaemia of renal insufficiency is mainly results from decreased erythropoietin production and impaired supply of iron to erythroid precursors. Anaemia results in fatigue, cognitive dysfunction and cardiovascular consequences and increased cardiovascular mortality. Correction of anaemia decreases LVH, LVH related hospitalizations and mortality of cardiovascular disease. Without erythropoietin supplementation only 2% (Int J Artif Organs 1981; 4:277-9) needing haemodialysis have a hematocrit of >0.4. Availability of erythropoietin and the use of parental iron has reduced the prevalence of anaemia in patients with renal failure. Anaemia associated with renal insufficiency results from decreased erythropoietin and iron availability. Erythropoietin, produced by the kidney, is essential for erythropoiesis (see Erythropoietin and Erythropoietin Receptor Signalling). Renal insufficiency results in decreased renal mass and consequently in decreased erythropoietin production. Erythropoietin levels in patients with renal failure are normal or slightly elevated, but they are 10-100 times lower than a normal individuals with similar levels of anaemia. Decreased erythropoietin hampers erythropoiesis contributing to anaemia (no 1 in figure 1). Erythropoietin supplementation corrects anaemia in most but not all patients. Folate deficiency and aluminium intoxication are of historical importance. Current management of dialysis patients includes folate supplementation and measures to prevent aluminium intoxication. Impaired iron supply to erythroid precursors remains the main cause of anaemia that does not respond to erythropoietin. Iron supply to the erythroid precursors is also limited by impaired absorption (3 in figure 1) and a functional iron deficiency (4 in figure 1). 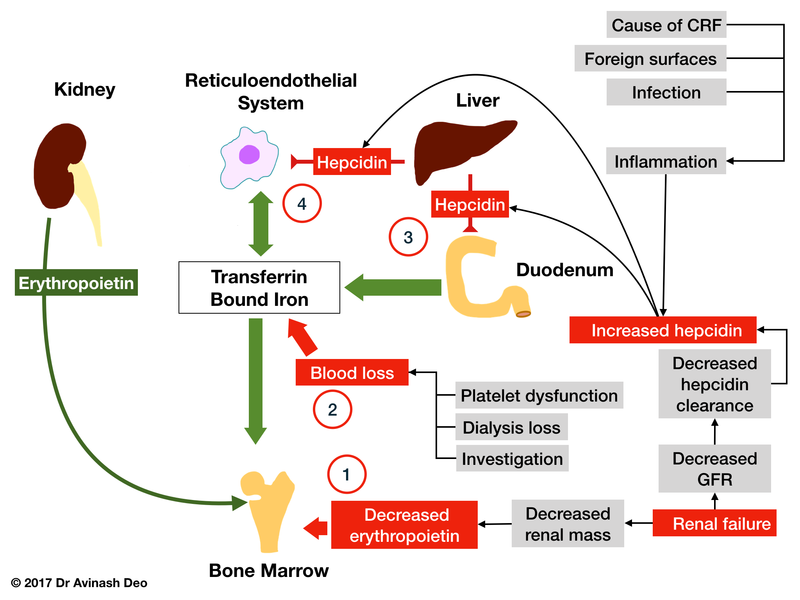 Hepcidin plays a central role disrupting iron supply in patients of renal insufficiency. It reduces iron absorption in the gut and hampers the release of macrophage iron. The latter results in a phenomena called as functional iron deficiency i.e. diminished iron availability despite adequate iron stores. Hepcidin levels are increased from increased production because of inflammation and decreased elimination as a result of falling GFR. Infections, exposure of leucocytosis to foreign surfaces during dialysis and from the underlying cause of renal insufficiency are the sources of inflammation. The degree of anaemia co-relates with the degree of impairment of renal failure. Anaemia is rarely observed in patients with creatine clearance of greater than 45ml/1.72m2. This corresponds to a serum creatinine of 2-2.5mg/dL. The anaemia is mild to moderate with the haematoctit stabilizing between 15-30%. Anaemia is less severe in polycystic kidney disease and to a lesser extent in hypertension. It may be more severe in diabetics. The presence of severe anaemia is an indication for evaluation for another cause of anaemia. Signs and symptoms are those of anaemia and the underlying disease causing renal failure. Complete haemogram with erythrocytes indices to determine severity of anaemia and to exclude co-existing diseases like iron deficiency and aluminium intoxication (microcytosis) or Folic acid/vitamin B12 deficiency (macrocytosis). Despite the fact that there is a relatively deficiency of erythropoietin, erythropoietin levels are not useful in the diagnosis of anaemia of renal insufficiency. The bone marrow tends to be moderately hypercellular with a slight erythroid hyperplasia. A bone marrow aspiration is not necessary for diagnosis. The treatment of anaemia of renal insufficiency in transplant ineligible patients consists of erythropoiesis stimulating agent (ESA), iron and blood transfusion. Transplant when indicated cures anaemia in 80% of the patients. Most authorities define anaemia as a haemoglobin of 13-13.5g/dL in men and less than 12g/dL in women. All patients with chronic renal insufficiency need iron supplementation. The route of supplementation may be oral or intravenous. Severity of anaemia, patients preference and adherence and previous experience with that route iron therapy are few of the factors determining the choice. In a meta-analysis of oral iron vs. parental iron, parental iron raised the concentration of haemoglobin by >1g/dL more often than oral iron. The risk of hypotension was higher and gastrointestinal side effects lower with parental iron (Am J Kidney Dis. 2016 Nov;68(5):677-690). As the safety of intravenous iron preparation has increased so has their use. Many trials comparing oral with intravenous iron therapy have shown a better response with intravenous iron. However intravenous iron therapy has not been show to be superior in some trials (Clin J Am Soc Nephrol. 2016 Jul 7; 11(7)). ESA are indicated in patients who have adequate iron reserves. These are patients with transferrin saturationis >25 percent and ferritin >200 ng/mL. ESA should be used in patients with iron deficiency (actual or functional) after iron replenishment. Two ESAs available are erythropoietin and darbepoietin. Treatment with ESA results in improved quality of life, improved cognitive function and reduces left ventricular hypertrophy. The target of therapy is to increase the haemoglobin to 11-12g/dL. Higher targets are associated with more side effects. The rise is typically achieved in 6-8 weeks of therapy. Erythropoietin is administered in a dose of 100-150 units every week. Hypertession is seen in about 35% of the patients. Darbepoietin as administered in a dose 0.45 μg/kg/week for patients on dialysis. Erythropoietin resistance is failure to respond to erythropoietin. The causes of erythropoietin resistance include inadequate iron availability (decreased reserves and/or functional iron deficiency) inadequate dialysis, marrow fibrosis associated with secondary hyperparathyroidism, folate deficiency, aluminium intoxication and co-existing inflammation. Dialysis should reduce blood urea to less than 35% to allow for optimal erythropoietin action. Dialysis: Dialysis has a small effect on the anaemia presumably by clearance of inhibitors. Peritoneal dialysis (PD) is more effective than haemodialysis. Reason a higher efficacy of PD is more effective in unknown but more effective removal of middle molecules (500-1500kD) and lesser of inflammation compared to HD may explain the higher haemoglobin in patients with on PD.